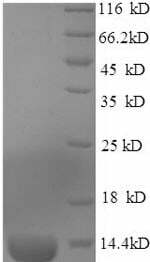 Small volumes of Guca2b recombinant protein vial(s) may occasionally become entrapped in the seal of the product vial during shipment and storage. If necessary, briefly centrifuge the vial on a tabletop centrifuge to dislodge any liquid in the container`s cap. Certain products may require to ship with dry ice and additional dry ice fee may apply. Endogenous activator of intestinal guanylate cyclase. It stimulates this enzyme through the same receptor binding region as the heat-stable enterotoxins. May be a potent physiological regulator of intestinal fluid and electrolyte transport. May be an autocrine/paracrine regulator of intestinal salt and water transport. NCBI/Uniprot data below describe general gene information for Guca2b. It may not necessarily be applicable to this product. GUCA2B: Endogenous activator of intestinal guanylate cyclase. It stimulates this enzyme through the same receptor binding region as the heat-stable enterotoxins. May be a potent physiological regulator of intestinal fluid and electrolyte transport. May be an autocrine/paracrine regulator of intestinal salt and water transport. Belongs to the guanylin family. Uroguanylin and guanylin distinct but overlapping patterns of messenger RNA expression in mouse intestine.Whitaker T.L., Witte D.P., Scott M.C., Cohen M.B.Gastroenterology 113:1000-1006(1997) Sanford L.P., Cohen M.B. 1. UGN exerts its inhibitory activity on the prendrin gene promoter likely via heat shock factor 1 action at a defined heat shock element site.